Last year, for Valentine's Day, Holly came up with the idea of a Valentine's Day Sock Hop. It was so much fun! We broke out the scarves and poodle skirts and stepped back in time to the 50s! I made a FREE packet for you all if you want to have a sock hop this year. It has posters for each station and certificates. Click the pics below to download them for FREE at my TPT store. We had four different stations. You will definitely need some parent volunteers to help you with this. The first was the Soda Shop. We served heart shaped pizza and made floats. They could choose from root beer or coke floats. You could do a "How To Make a Float" writing activity before the sock hop. Lots of kids have never had a float before, amazingly! We also had a bubble gum blowing contest. You will definitely need to be there to teach them how to blow a bubble. So many of ours didn't know how. There was a matchbox car race. We had them bring in their own matchbox cars, but we had some extras. We have ramps in our hallways, so we had the races there. And finally, we had the Sock Hop station! We just let them dance their hearts out to 50s music. 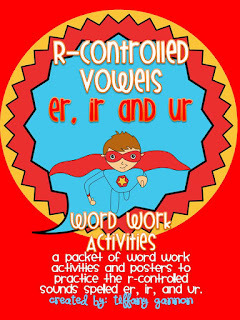 I also just uploaded a Super -er, -ir, and -ur Word Work Activity packet if you are working on bossy r.
Adorable idea. Thanks for sharing your Sock Hop celebration. It looks like so much fun! Thanks for sharing! I just picked up your /er, ir, ur/ activities. We are doing it next week in our reading series and it will work pERfectly! Love this idea! Too cute! Thanks for the freebies! Thanks for the sock hop freebie! :) When I taught third grade, we studied the 1950s and had a sock hop at the end of the unit and loved it. What a great idea for Valentine's Day! looks like soooooooo much fun!!! I love it! What a fun way to spend the day!! where are your backgrounds and borders from, and how do you make them?! they're awesome, and i'd love to try and make them!! Love this! Question, in your rotations do you have the whole class move to the stations or do you divide them up?